If you’re planning a trip north into the North Maine Woods, get ready to meet the “gatekeepers,” the men and women who keep track of who goes in and comes back out and what their plans are while within its borders. Covering more than 3.5 million acres of commercial forestland, the North Maine Woods is a partnership of large and small landowners, including corporations, individuals and families, that manages a large chunk of Maine. Over the years, landowners have established a series of gated entrances into the North Maine Woods, not to restrict access but to control it, according to Al Cowperthwaite, executive director of the North Maine Woods. The eyes and ears keeping track of all comings and goings are the 40 receptionists who monitor the 14 checkpoints — or gates — leading to and from the North Maine Woods. Anyone entering the North Maine Woods must first check in at one of the gates. The checkpoints are monitored by the receptionists, who live in gatehouses or nearby cabins, either physically or electronically 24 hours a day, seven days a week from May 1 to Nov. 30. When a visitor comes through, the receptionist takes down some basic information including vehicle license plate number, name and home address, and the visitor pays an entrance fee based on residency, age, purpose of the trip and how long they plan to stay. Because of that system, which is now computerized, they know at all times who is where and doing what in the North Maine Woods, Cowperthwaite said. “There are no secrets in the North Maine Woods,” he said. several months out of the year or married women looking for extra money for the family. These days, according to Cowperthwaite, women still outnumber the men by about 3 to 1, but the demographic has changed. 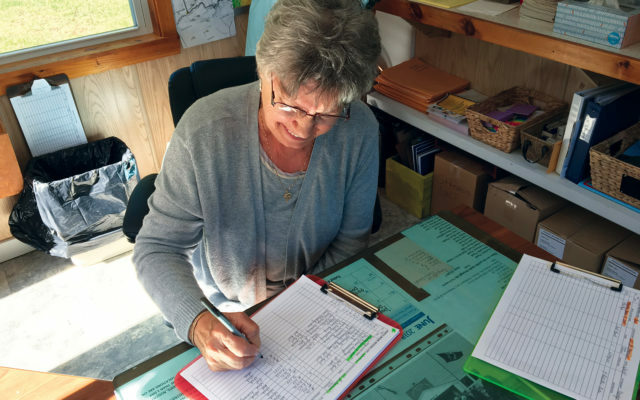 Carolyn Gardner has been a North Maine Woods receptionist for eight years at the St. Francis Gate located about a quarter-mile off Route 162 and 30 miles west of Fort Kent. The system, Gardner explained, does not require someone entering the woods to exit through the same gate. Access is controlled by a simple cable stretching from the gatehouse porch to a pole across the road. Once a person is cleared to enter or exit, the receptionist lowers the cable with a simple wooden lever inside the building. The gates are closed and locked from 9 p.m. to 5 a.m., but Gardner said no one has ever been trapped in the woods overnight who didn’t want to be. Darlene Kelly Dumond, an Allagash native who works weekends at the Little Black Gate just outside the village of Allagash, has returned to her roots. Kelly Dumond admits she could not wait to leave once she graduated high school. More than three decades later, she’s back and there is nowhere else she’d rather be. Working as a receptionist for the North Maine Woods, she said, is a perfect fit for her rediscovered lifestyle. Kelly Dumond’s alarm goes off at 4 a.m., and the coffee is brewing soon after. “At 5 a.m. I turn on the lights, unlock the door and we are open for the day,” she said, adding there are times people are already waiting to get into the woods. More often than not, the traveler stays to exchange pleasantries before hitting the roads to that favorite fishing hole or campsite. Beyond checking people in and out of the North Maine Woods, the receptionists often have to be ready at a moment’s notice to render aid — be it assisting an unlucky traveler who has a flat tire or assuring rescue personnel can respond quickly to medical emergencies. For example, many newcomers may not know all roads within the North Maine Woods are private. Logging trucks always have right of way. The drivers of those big rigs communicate with each other over special radios so they pretty much know the location of every truck on the roads. Recreational visitors, however, are often clueless. So it’s up to the gatekeepers to warn non-loggers and other visitors to drive slowly, take extra caution at all curves and to always give the logging trucks the right of way.